Since they face the elements on a constant basis, exterior doors need to be tough and look beautiful, rain or shine. 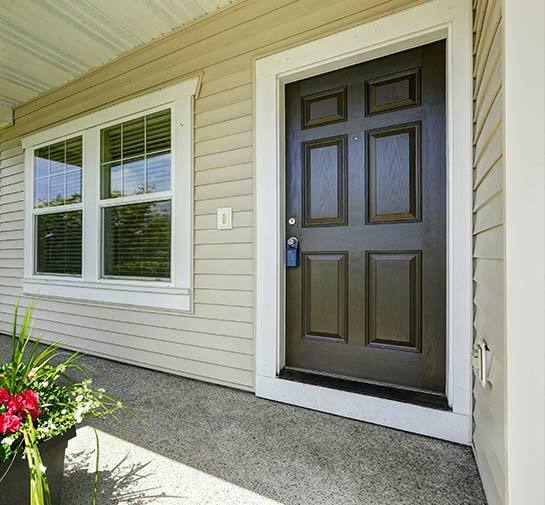 At Trim Team, you’ll be able to find fiberglass and metal exterior doors. These materials are known for their low maintenance and high reliability. Not only that, our exterior door options look beautiful and can replicate any material or color. Deciding on the perfect exterior door depends on the homeowner’s own wants and needs. Fiberglass and steel doors each provide a large variety of positive attributes and qualities. Both are highly customizable in shape, design, and color. Trim Team proudly provides Therma-Tru and Neuma brand doors. On top of being secure and tough, fiberglass doors are weather-resistant. This makes them an excellent option for homeowners in the Southwest since fiberglass can face the elements without fading or losing shape. As a material, fiberglass is excellent for high-traffic entrances. Fiberglass doors are also highly customizable. They can be painted in any color and can even be made to look like wood, all with the same reliable characteristics of fiberglass. Fiberglass doors can also be designed to accommodate glass accents. This allows more natural light to enter your home. There are a variety of design options for solid panel fiberglass doors that can turn a simple blank slate into a beautiful door you can be proud of. Odds are you’ve walked through your fair share of steel doors and haven’t even noticed. This is because steel doors don’t look like giant slabs of steel. Steel doors are secure and durable but, above all else, they’re affordable. Since they are low maintenance and weather resistant, they’re excellent for El Pasoans who are looking for a great entry door that can be painted to look like wood. El Paso is a beautiful city and patio doors give homeowners the ability to welcome the desert vistas and sunsets into their homes. A reliable and beautiful patio door can change the entire mood of a room and house. There are many patio door options available, from the subtle and refined to the detailed and luxurious. Patio doors are supposed to serve a variety of purposes. The most obvious one being the ability to let as much light in through those big windows. For the most reliable and useful options, choose Trim Team.